For other American cuisines, see South American cuisine, Cuisine of the Americas, and Global cuisine. 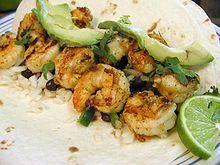 North American cuisine includes foods native to or popular in countries of North America, such as Canadian cuisine, American cuisine, Mexican cuisine and Central American cuisine. North American cuisines display influence from many international cuisines, including Native American cuisine, Jewish cuisine, Asian cuisine, and especially European cuisine. As a broad, geo-culinary term, North American cuisine also includes Central American and Caribbean cuisines. These regions are part of North America, so these regional cuisines also fall within the penumbra of North American cookery. The term "regional" is somewhat ambiguous, however, since the cuisine of Puerto Rico can differ markedly from Cuban cuisine; Mexican cuisine spills across the border into the Tex-Mex and Mexi-Cali "sub-cuisines"; and the cuisines of Michigan and Ontario have more in common with each other than either has with the cuisines of Manitoba or Iowa. This page was last edited on 29 March 2019, at 12:14 (UTC).